I first heard news of our local Pathmark's closure in a South Slope Community Group e-mail, and the news was confirmed during a visit to the supermarket yesterday. The 12th Street store will be closing shop in November. Last month the A&P company filed for bankruptcy, and announced impending sales & closures of their 296 supermarkets. These include forty-two Pathmark stores in the New York area. On August 11th, the UFCW Local 1500 released tables showing the status of the 42 Pathmarks, though any sales listed there will not be finalized until auctions are held late next month. 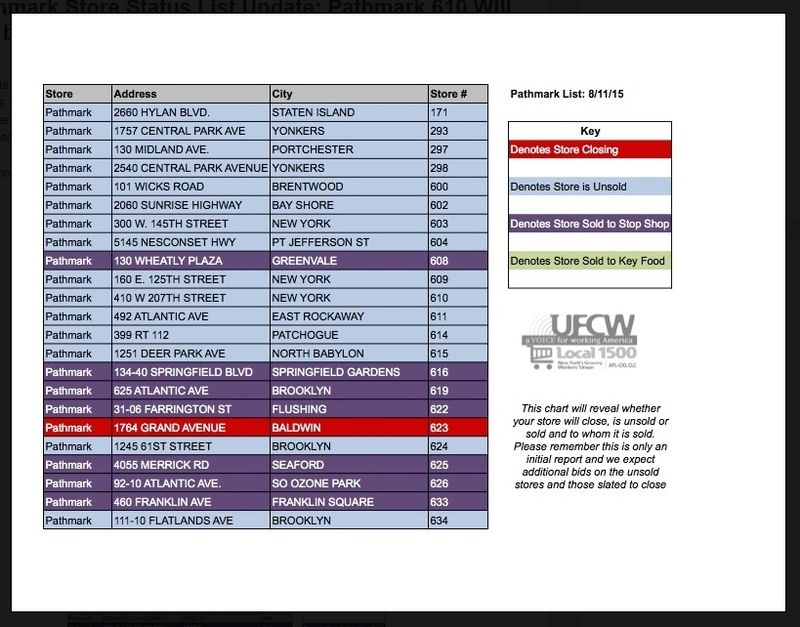 As you can see below, 1-37 12th Street is listed as unsold. Unclaimed stores will be sold at public auction at the end of October. Let's hope that the Gowanus store remains a supermarket. Nothing too fancy & nothing too expensive. And preferably not a Key Food, if current union negotiations with Key Food concerning the planned acquisition of 17 A&P markets are anything to go by. Although our priority and our first concern is for our members to continue to work without any loss, it is Local 1500, Local 342 and Local 338’s position that if Key Food was allowed to reduce pay by $5 per hour, reduce hours from 40 to 35 hours per week, and reduce health coverage from family plans to single that the damage would be catastrophic. Clearly our members would have a very hard time, and shouldn't have to exist under those conditions. The proposed pay and hour cuts would equate to well over $250 per week in lost wages and the difference between a single and family medical plan could be as much as $600 to $700 per month. If that’s not enough, the company also has the arrogance to demand our members begin making a weekly contribution into this new inferior healthcare plan. These terms are simply unacceptable. We are now more aggressively seeking other companies that are willing to purchase these same stores. (New York) cities. Both Pathmark & Whole Foods sit right on the Gowanus, but their ambiance & customer base couldn't be farther apart. Whole Foods makes its situation part of its appeal - exactly the setting for the couple pictured right on the cover of this week's New Yorker. A perfectly tamed industrial chic. You'll feel you've really made it here! Farther south, in the Pathway parking lot, you might find be the only one admiring the views. All the better. The landscape's unsuffused with self-congratulation. Expressway looms above, and water's gazed at through a gap in the chain-link fence. 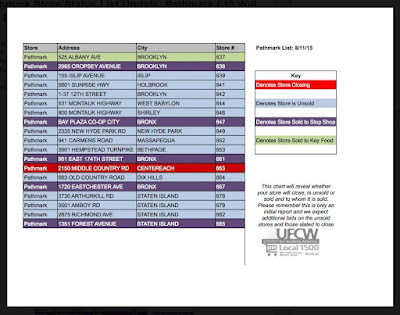 Working and middle-class families shop at Pathmark. Here the reality of budget trumps the charms of food lifestyle. Here the art of stretching a dollar. This is how most of the city shops. At Whole Foods, by contrast, money appears to be no object. I'll admit that I buy a few things there occasionally - mostly from their store brands, which are not a bad deal, even if the rest of the prices there are sky-high. But I'm strictly a small-basket, handful-of-items shopper. Most of my food is bought elsewhere. I can't conceive how much it would cost to feed a family at Whole Foods alone, and I gaze with wonder at the heaped shopping carts in the check-out lines. We need our staple food stores.